I recently realized that Soba Totto was nearby one of my projects. How convenient! I've been wanting to try it. I decided to stop by on my way back to the office and while it didn't yield the quick lunch I should have had, I had a leisurely, very well rounded and perhaps too filling of a lunch. Their lunch sets are not cheap, but for the amount of food you get, I don't think anyone would complain. 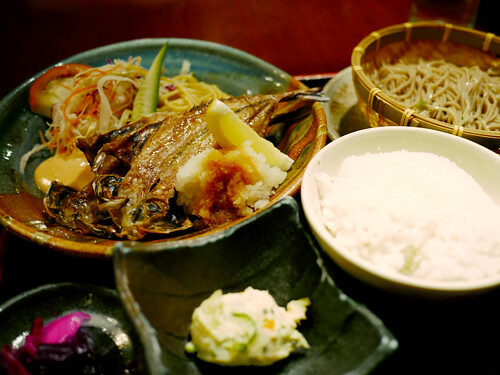 I went for the "Aji no Hiraki Teishoku", grilled horse mackerel (literal translation open-faced mackerel set menu), which came with a starter salad, Japanese potato salad, cabbage salad and pasta salad with the fish, pickles, rice and a choice of warm or cold soba. I'm still rather full, but very happy.